Danganronpa has never been a "happy" series—as it centers around imprisoned high schoolers whose only means of escape is to kill a classmate and get away with it—but Zettai Zetsubo Shoujo: Danganronpa Another Episode takes it a step further by making its backdrop a city where children are mass murdering adults. Another Episode takes place shortly after the end of the first game and focuses on Komaru Naegi, the sister of that game’s protagonist. In Another Episode, Komaru is trapped in a city where children (aided by Monokuma robots) are massacring the adult population. After being captured by the ringleaders of this catastrophe—five elementary school kids—she is released back into the city to be hunted down and killed alongside other relatives of characters from Danganronpa. But luckily, Komaru is not alone in this urban warzone as she soon teams up with first game survivor Toko Fukawa—an antisocial bookworm who shares a mind with a deranged serial killer personality. Together, the two girls try to survive in this city gone mad. Another Episode has everything you’ve come to expect in a Danganronpa story—even with the drastic change from visual novel to third-person shooter. There’s a diverse cast trapped in a confined area, a grand mystery to be uncovered as the game goes on, lots of talk about hope and despair, and more than a few incredibly messed up murders. Taking place in between the two main games, Another Episode does an excellent job of connecting to the plots of both without losing its own unique identity. In fact, with some minor tweaks, Another Episode could easily be a stand-alone story and work perfectly fine as such. As Komaru has been imprisoned for over a year (as a hostage to provide her brother with a motive for murder), she has no idea what is going on in the city and is thus a perfect audience proxy for newcomers to the franchise. Of course, while it could be played as a stand-alone game, it is much better when played after the other two—if for no other reason than it actively spoils both Danganronpa 1 and 2. There are many connections strewn about that explain key mysteries of the overall series and expand the world outside of the limited, single-location viewpoints of the other games. 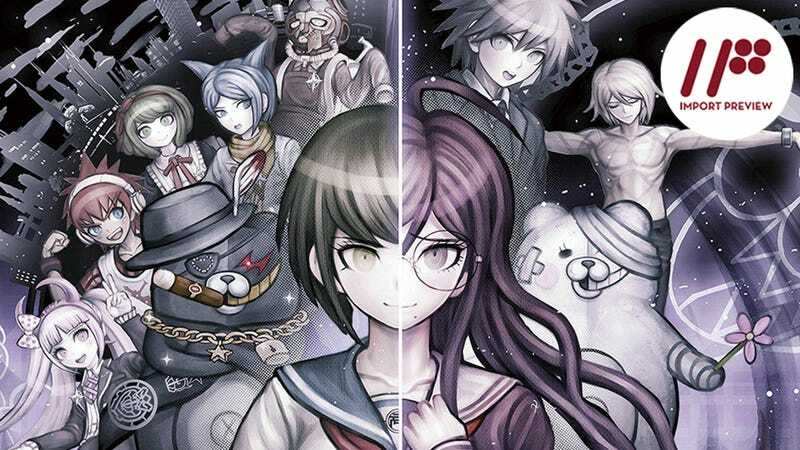 Characters from both main series games come in and out of the narrative; and while the events of Another Episode don’t directly cause Danganronpa 2, there are more than a few connections that build a base for that story as well. You’ll spend your time in Another Episode in one of three ways: lengthy voiced cutscenes that move the plot forward, third-person shooting sections, or puzzle rooms. When it comes to gameplay, the puzzle rooms are the most fun the game has to offer. As you progress through Another Episode, Komaru gains power-ups to her robot-killing gun that affect the Monokuma robots in different ways. One setting on the gun, for example, makes a Monokuma dance while another electrocutes a small group of Monokumas—or far more if they’re all standing in water. Every once in a while Komaru and Toko will come across a puzzle room. Inside these rooms, you are only allowed to use certain settings of the gun to eliminate the Monokumas inside (or face a penalty). You are also granted the ability to see the room in its entirety from a top down perspective at any time. Thus, you must use your brain, the gun, and various Monokuma-affecting obstacles in each room to claim victory. For the most part, the puzzles are relatively easy in difficulty (I only found myself stuck twice). There is almost always a clear cut and obvious path to clearing the room. Yet, I was genuinely excited each time I came across a puzzle room and had to figure it all out. Moreover, the puzzle rooms all but require you to know the ins and outs of each of the gun’s settings—and you’ll often learn tricks in the puzzle rooms that make the normal combat sections infinitely easier. Both in and out of the puzzle rooms, Another Episode is an over the shoulder third-person shooter. As you move throughout the ruined city, you come across—or are alternately ambushed by—groups of Monokuma robots. There are many different types of them—and one that is especially terrifying—and each is especially vulnerable to one of the settings on the gun. Like most shooter enemies, every Monokuma has a weak point—the same weak point, actually—its red robotic glowing eye. However, this is—by design—much harder to hit than in other shooters. While most games allow you to change your aiming sensitivity in the options menu, Another Episode only lets you tweak it through skills you obtain throughout the game. Honestly, this makes a lot of the fights more difficult than they should be, as you are fighting the controls as much as the Monokumas. As you probably gathered from the summary of the game’s first hour or so near the start of this article, Another Episode is a disturbing game on several levels. Kids murdering adults is the central conflict of the game—along with the adults’ plans to respond in kind—and that’s just to start. As you move through the town, you’ll constantly see children playing with dead bodies (which are thankfully shown only as blue and red silhouettes). But the backstories of the five children behind the chaos in the city easily take the cake for the most disturbing aspect of the game—they're honestly so messed up that it's nearly impossible not to feel for them even as they gloat about the mass murder of adults and their children's paradise to come. Simply put, despite the bright colors, stylized graphics, and hot pink blood, this is not a game for the squeamish or faint of heart. Zettai Zetsubo Shoujo: Danganronpa Another Episode is certainly a must play for any Danganronpa fan. It has many connections to the other two games and helps to expand the world outside of the death games of the main series. Better still, however, is the fact that it stands largely on its own when it could have been nothing but a set-up for Danganronpa 2. The biggest polarizing point the game has to offer is the subject matter: violence against children (though your characters never actively take part) and alternatively children committing acts of torture and violence on par with the worst of serial killers. Simply put, it is the most dark and disturbing chapter of the series so far. Zettai Zetsubo Shoujo: Danganronpa Another Episode was released for the Playstation Vita in Japan on September 25, 2014. There is currently no word on an international release.